There have been quite a few fanciers who used to be successful in the long distance races but who lost momentum over the years. That is why they decided to do things differently, like in the old days. Once the racing season is over it is time for winter breeding. This takes some thinking. This is the moment when you choose the direction for next season. Do you want to join the young pigeon fanciers who keep their pigeons in the air from mid June until the end of September, without giving them a day off once in a while? Are you one of the many fanciers who know everything about antibiotics and cortisones? Will you be darkening your pigeons and are you planning to put them to the test week in week out? Everyone is free to make choices of course. We would like to warn you: if this is the direction you take you have to keep in mind that water, some seeds and some vitamins will not be enough. You need Baytril, Suanovil, Linco-Spectin, CX60 etc. Or maybe you can rely on the preparations of your veterinary surgeon. 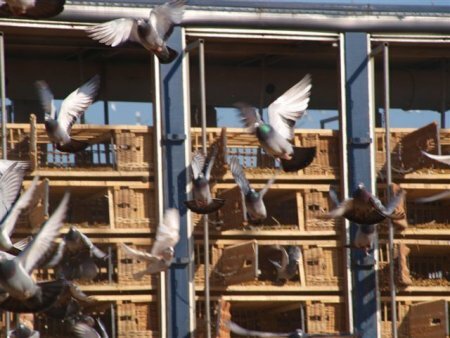 Let us be honest: wouldn’t you agree that this way of pigeon racing could put the future of our sport at risk and possibly your own future? Could it be that the focus on medical guidance and training for young birds makes it difficult to compose a team of healthy and strong old birds these days? Most of the young birds that made history in the races from Argenton, La Souterraine or Bordeaux did not reach the age of three. If they did, they were not usually capable of winning important prizes anymore. That is because they lost some of their speed in their first year. After several years of experimenting it seems that a lot of fanciers have gone back to the methods of previous generations. Today, young birds are again trained to fly from Orléans or sometimes Bourges. It seems that young birds are being spared again. This step back did not happen overnight. There is more to it. There have been quite a few talented long distance fanciers who tasted defeat on their home ground in recent years. That is because they considered themselves undefeatable but they came home empty-handed. We have never heard so many fanciers talk about sparing their pigeons in December as this year. Still there are plenty of fanciers who continue to focus on the racing with the young birds. They would rather give their birds some antibiotics than to give them some time off. This is of course not incomprehensible: you have to be patient with your old birds, which is not the case with young bird racing: you breed them and seven months later the racing is over. We are not here to tell other fanciers what to do. We just want to point out that it is wise to think about your future seasons. It could save you a lot of time and money. If your goal is to become a successful long distance fancier in two or three years time you need a different approach than the fanciers who focus on young birds racing - unless you are planning to do both. This is in fact a very difficult task and only a tiny number people have done this successfully. Ik denk dat je nog altijd je mannetje kan staan, zonder al teveel te prutsen met medicatie in het jonge duivenspel. Maar dan moet je er wel iets voor doen. Niet te vroeg beginnen, en keuzes maken. This is so true. To win the distance is all about patience, feeding, breeding and care. Lightly training your young birds with maybe 1 or 2 races for experience.Then moulting them out with the best of care and attention. As yearlings good education, single up training, still plenty of good food, and maybe 5 or 6 races up to 500 km. Now what is left will be the best capable with good care of those 1000 km plus races, but still only competing in maybe 6 races a year. And I am speaking from experience winning out of 517 miles 1st prize 5 years running, 435 miles 3 years running etc. And all with out any antibiotics ! is dit een artikel anno 2012 of komt het uit de oude doos ?